The letter is addressed to the wrong party, not that it matters. Bayit Yehudi faction Chairwoman and Knesset Member, Ayelet Shaked, wrote a sharply worded, no-holds-barred and bitter letter to US Secretary of State John Kerry, criticizing him for forcing Israel to release blood-soaked murderers. This pressure was exerted on Israel in order to placate arch-terrorist PA Chairman Mahmoud Abbas and thus cajole him to re-start the so-called "peace process". She goes on to complain that if such killers were to have murdered American citizens, the US would never release them (ed. note: one of the released terrorists murdered an American-Israeli, but Israel refused to differentiate between victims despite US disapproval). To make the hypocrisy even more poignant, the US Administration refuses to release Jonathan Pollard, whose unprecedented jail sentence makes the double standards that much more vicious. I’d like to address Ms. Shaked on this emotionally bitter menu served to Israel. You are so right in bemoaning the price Israel will have to pay for such foolishness. You are accurate in fearing for the lives of your children; history has proven time and time again that murderers released by Israel have quickly added to their repertoire of murdered Jews. The complaint about Pollard is also correct, as is your assertion that the US would never release killers who committed such atrocities against US citizens. Kudos to all your points. Unfortunately, though a Knesset member and, I assume, quite educated and knowledgeable, your letter misses a few sharp turns on its way to the ‘complaint department.’ Let me try to explain. At the outset, I apologize if I hurt your feelings, but I believe that your naiveté has taken over your senses - because your anger is misdirected. First of all you need to remember, that it is your own esteemed, delusionary elder-statesman, Israeli President Shimon Peres, who coined the infamous phrase ‘korbanot ha-shalom’ – sacrifices for peace - during the first intifada unleashed by his ‘peace-partner’, Yasser Arafat. As the Land of Israel was drowning in the bloody carnage of suicide bombings, road-side shootings and hidden explosives, he needed to justify the fallacy of his misguided vision and the deplorable kowtowing to the arch enemy. Peace: The thousands of Jews murdered and maimed are simply that many more bricks installed in the yellow-brick-road leading to Utopia and Shangri-la. He thus termed all those murdered by terrorism as simple "pot-holes on the road to the blessed peace" which he envisioned. Nothing to fret about, said he. One more dead Jew is one step closer to the New Middle East about which he fantasized. One more bus blown up was merely a momentary block to the approaching peace. A few more widows, orphans and shattered families are minor obstacles on the road to bliss. We are Jews, after-all and we faced such adversity throughout the millennia, so why fret now? The Messiah is just around the corner, on the road from Ramallah or Jenin. As such, Ms. Shaked, you must understand from the above that the released killers are actually a boost to the over-all strategy towards peace. Some logical minds have figured out that their heinous crimes created a better situation and are paving a smoother road for peace. The thousands of Jews they murdered and maimed are simply that many more bricks installed in the yellow-brick-road leading to utopia and Shangri-la. How could you allow your emotions and fears to cloud the beautiful vision lying just below the horizon? Why fret about the danger to your children? Peres doesn’t. And his exalted current position, after all the damage he has sown, clearly proves that the stupid are leading the blind. I hope this is clear enough. Let’s now address your next complaint that the US would never release bloody terrorists. That, too, is a misplaced complaint. It is quite obvious that you are not well versed in American anti-terrorism policy. You are obviously not aware that your complaint of American cynical hypocrisy is nothing more than a protest lodged by the uninformed. So read and learn. The US, Ms. Shaked, does release terrorists, homegrown or otherwise. Let me give you just one or two famous examples of very famous releases. So, Ms. Shaked, pay attention. The truth is staring you right in the eyes and you simply are blind to it. You want more names of killers magnanimously released by the US for the sake of peace? Unfortunately the list is far too long for this short letter to you. Suffice to state that one-thousand-three-hundred-and-thirty-eight (1338) murderers have been released by execution in the United States. Over thirteen-hundred killers have been given their US-style exit papers. Oh, yes. Did you hear about all those American drones in the skies of the Middle East? 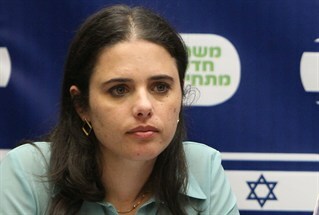 They are there, Ms. Shaked, to ‘release’ terrorist leaders from the miserable life they are foisting on others. Intolerable, so ‘release’ them. Just thought I’d throw that in. Now that I have your attention, kindly indulge me and follow my line of reprimand and accept the error of your unfounded complaints. If your own Prime Minister, your own Knesset members don’t really give a darn, why are you directing your complaints to an administration that follows suit and doesn’t give a darn? Perhaps you can explain to me, how it’s possible that Prime Minister Netanyahu repeatedly vowed that he will not succumb to the pre-condition demands and that he will absolutely not release terrorists with blood on their hands, yet reneged on his promise and followed orders from those who don’t give a hoot about your children or mine? Aren’t you questioning the fact that Netanyahu and his side-kicks are jeopardizing your children, putting their lives on the line? Isn’t it more their obligation than Kerry’s to safeguard Israeli citizens? The cliché: you can lead a horse to the water but you can’t make him drink has proven to be an idiotic phrase. It’s obvious that a supposedly adamant and reluctant Netanyahu is sloppily slurping from the trough. Let me sum it all up. You see, Ms. Shaked, the terrorists murdered Jews, you and your children are Jews and Jews have always been dispensable and disposable. What’s so hard to comprehend? And the Pollard cases of miscarried justice? He, too, is a Jew. No need to apologize. I know you forgot.